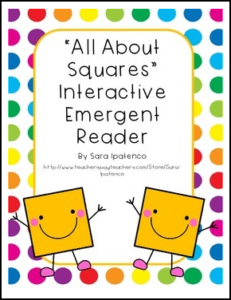 This interactive emergent easy reader, by Sara Ipatenco, is designed to help students learn more about squares. Students will complete 9 pages of activities that will help them identify squares. Activities include recognizing and coloring squares, counting sides and corners of squares, drawing things shaped like squares and turning squares into pictures. This is a great way to introduce shapes or review shapes students have already learned. Use the books as class practice, homework, morning work or as an assessment tool.